Life is all about impressing others. That has always been true, and all the more when you’re the ruler of one of the five tribes with aspirations to be King of all the people. Only the ruler who has the most impressive Monuments built to his God, the ruler who employs the best craftsmen, the ruler who sacrifices the most cattle to his gods is fit for that honour. If that sounds like a job for you, then Splotter Spellen has a position to offer for you in the heart of Africa. In the city of Great Zimbabwe, to be exact, capital and cultural center of the Kingdom of Zimbabwe from the 11th century on, but long since fallen into ruin. Back in the days of The Great Zimbabwe, though, being the King here was the big price. And that’s why you should start herding your cattle and building your monuments, your competition isn’t sleeping. They weren’t endangered back then! As a ruler of one of the five tribes, your goal is to surpass all the others in renown, that is to say boring old victory points. The best way to score victory points is to build monuments, but that’s easier said than done. Small monuments are easy, but everyone can build those. Big, impressive monuments are expensive to build, and you need craftsmen to do it. And then you can’t even do everything at once – it’s tough to be a great ruler. First things first, though: each player starts with one very unimpressive level one monument near the center of the modular game board. On each turn, you can either build a new monument, improve your existing monuments or bring craftsmen to the board. Without craftsmen you can’t improve your monuments, so they are a good place to start: for each of the four crafts – vessel making, ivory carving, wood carving and the much more expensive diamond cutting – there are only two technology cards. You need one of those to recruit that type of craftsman, so not all players can have all types in their service. Once you have the technology, you can put a craftsman on the board by just paying a few cowples (cow meeples), the only condition is that he has to be within three steps of the resource he needs. Paying for the technology card in the first place is more interesting: you pay by raising your Victory Point Requirement, the score you personally need to win. At the start, all players need 20 points to win, but taking a technology card increases your personal goal by one to four points. When you think about it, that means inventing pottery makes it harder for you to win. But you won’t be thinking about it, at least not during the game, because The Great Zimbabwe gives you more than enough other things to think about. But this way of payment creates an interesting dynamic: obviously, having craftsmen working for you helps you win. But it also makes it harder for you to win. The decision what is worth taking and what isn’t is not easy, especially not when other types of cards also increase your goal score. What to do with those craftsmen now, after you trained and hired them? You improve your monuments, because that’s the fastest way to score points. To go from level one to level two is cheap and easy, you just need one of any type of goods. You use up one resource of the right type on the board, in range from the craftsman, then you pay some cowples to the craftsman’s corresponding technology card – from where they will go to the card’s owner at the end of the round – and then you make sure you can actually transport the goods crafted for you to your monument. Just like for resources, the basic range to transport goods is three steps and bodies of water only count as one step, no matter the distance you travel on them. Unlike resources, when transporting goods you can use other monuments as transportation hubs by paying one cowple, extending your range by another three steps from your hub. There is a strong logistical streak in The Great Zimbabwe, you spend a lot of time figuring out transport routes. Not yet, of course, but for each level more you need one more type of goods: to go to the maximum level of five you need one wood carving, one ivory carving, one clay pot and one cut diamond. Even that would still be manageable, but then people start being greedy and recruit secondary craftsmen, professionals of their craft who take the goods from an ordinary craftsman and one more resource to refine it into something better, for example they can make an ivory carving into a throne. Now, quiz question: once someone can make thrones, do you think the Gods will let you upgrade your monuments with ordinary ivory carvings? Of course not! Once someone brought a secondary craftsman to the board, you will need their goods to upgrade your monuments, the matching primary is no longer enough. So now you have to pay a primary craftsman and use a resource, transport their goods to a secondary craftsman, pay him, use another resource, and then transport the secondary goods to your monument to upgrade it. To upgrade your monument to level five now requires seven resources and a whole herd of cowples payed to other players. (Seven because diamond cutters don’t have a secondary craftsman – what would you refine a diamond into?) And because the fun never ends, each resource can be used only once per round, if you’re not first or at least second in turn order you are unlikely to get all the stuff you need. And even as the second player, you may have to do some remarkably roundabout logistics before everything is in place. Fortunately, you have a lot of control over when you take your turn. At the start of each round, player order is auctioned in a very interesting system where you distribute cowples among all the players and the later you pass the earlier you take your turn. You’re giving gifts to the other rulers to impress them into letting you go first. I told you it’s all about impression. It’s a fun twist that the cattle you pay is really distributed among the players: passing early while other players are fighting over who goes first is very profitable indeed, and you wouldn’t complain about a free herd of cowples, would you? Taking your turn at the right time, the logistics of upgrading your monuments, making money – well, cowples – from craftsmen, all that is a lot to think about already, trust me. But the best part is yet to come. On your way to be King, you can also pray for help from your God or pay for the services of powerful specialists. During the game, you may choose one God to pray to who will give you a powerful bonus, like increasing your transport range, giving you free cows when bidding for turn order or letting you use a resource twice in one round. Because the effects are so powerful, you can only have one God: monotheism is for game balance. 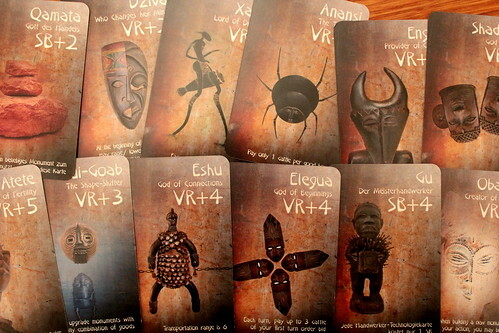 Picking a god also increases your goal score again, and depending on your deity of choice by quite a lot more than a technology card: worshipping Obatala, Creator of Mankind, increases your goal by an indecent seven points, but lets you build two new monuments instead of one when you build new monuments. On the other end of the price range is Xango, Lord of Drummers, who decreases your goal by two points but doesn’t do anything else for you. The specialists – who are actually special actions, not specialists, at least I never met a guy called Rain Ceremony – work similar to the gods, but you can have more than one of them and they demand cowples for their services in addition to the increased goal score. They let you grow your herd every turn, add water to the board or even create new resource fields. But again, you should only pick a God or a Specialist after some good, hard thought, if you don’t get enough use from them after taking the cards, they will make it harder for you to win, not easier. The Great Zimbabwe is definitely among my favourite games from Essen last year, if not the favourite. That’s fortunate for me, if it wasn’t I’d be upset about the rather steep 75€ I payed for it. As it is, even at this high price, I consider it money well spent because this is a great, tense and strategic game. If you know Splotter Spellen’s popular game Indonesia, then I can tell you that The Great Zimbabwe is not as heavy as that, but it also plays in about 90-120 minutes with players who know the game, instead of filling an evening like Indonesia does. And it fills every minute with decisions to make. 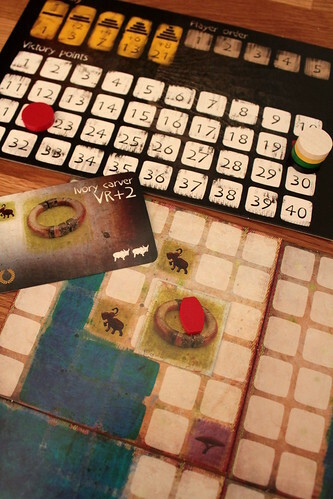 From the humble beginning with a level one monument and three cows, The Great Zimbabwe gets going very quickly, there is no long ramp-up period. Nevertheless, your actions on the first turns set up your strategy: which Gods and Specialists you pick or don’t pick, where you place your craftsmen, how high you allow your score goal to go, all those decisions will matter later in the game. 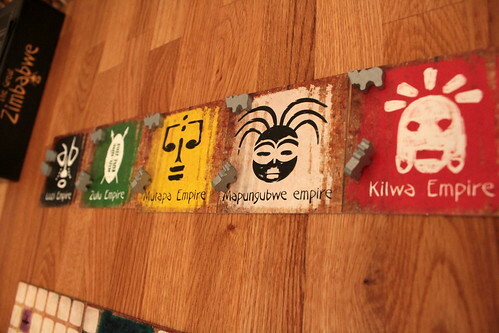 But even with all those options, The Great Zimbabwe plays quickly – except sometimes when someone overthinks their options, I’m not naming any names – and you have very little downtime. Finally, there is very little luck in the game – only in the starting player order – and it looks great as well. The board is functional but pretty, the card design is outstanding. 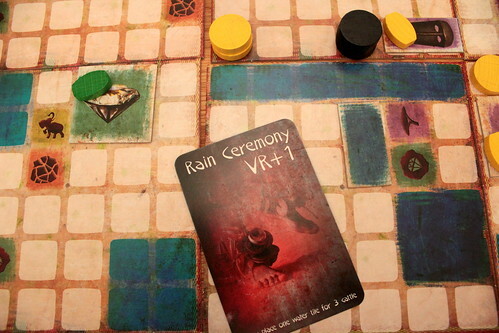 If you are interested in strategic games in the heavier weight classes, especially ones with an unusual setting, then there is nothing about The Great Zimbabwe that you wouldn’t enjoy, except maybe the aforementioned price tag. And the availability, Splotter Spellen are not known for their big print runs. But if you can get your hands on a copy, take it.